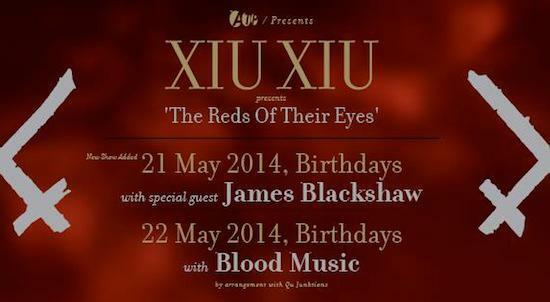 Experimental post-punk group Xiu Xiu are set to play two ATP-hosted shows at Birthdays in London this Wednesday and Thursday, May 21 and 22, performing a special show, entitled 'The Reds Of Their Eyes'. "The intention behind the Reds Of Their Eyes shows being in a small space is to be much, much, much closer than the whites of their eyes," says Jamie Stewart of Xiu Xiu. "It's about being smashed, intense, physical, truly personal and in the end ruined, but perhaps redeemed, by being unable to ignore the inches-away crazed gaze of a fellow human." Special guest James Blackshaw will be appearing on the Wednesday night, with Blood Music offering support for Thursday's show. Luke Turner of the Quietus will also be playing a guest DJ slot on the Thursday wherein he intends to add his weight to the ruination with some tunes from the belly of the Baader Meinhof Bum Dungeon. "These shows offer the chance to invite some special guests operating in violently contrasting fields of intensity," says Stewart. "James Blackshaw joins us for the first show, a man whose totally beautiful, radically expanding long-form acoustic guitar pieces I have followed with furious intent for years. Then for night two, we are psyched to welcome Blood Music, from the black-hearted frontier of new London noise-rock and sharing a certain brutalist kinship with our current groove." "See you there, in the dark, at point blank range," says Stanley. Head to ATP's website here for more info and ticket details.